My granddaughters came to visit us last week during their summer vacation. My eldest granddaughter, Ivie invited her friend Christiana to come spend the day with us. Ivie meet Christiana in school when my granddaughters lived with us during my daughter’s deployment. The two of them have kept in touch with each other over the years via email. I decided to take the girls to the beach and go bicycle riding. The youngest granddaughter does not know how to ride a bike, so I thought about renting a bicycle for all of us. 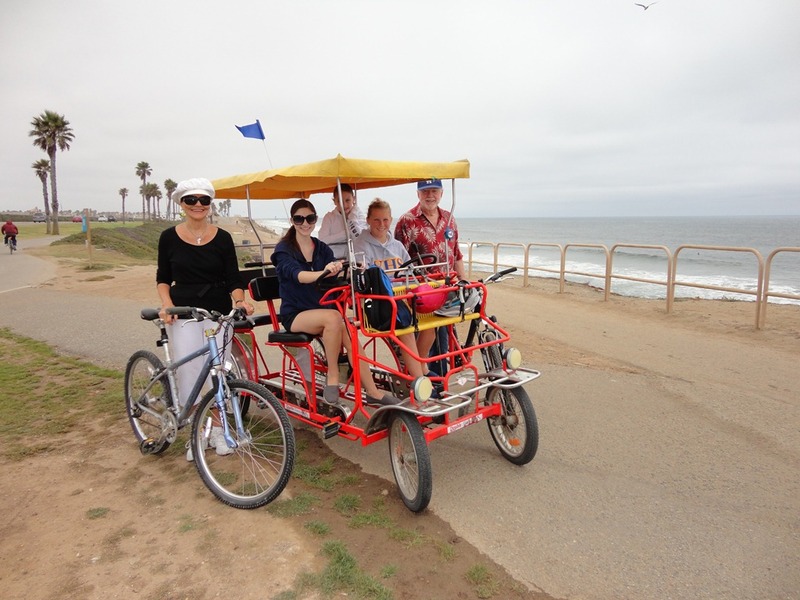 They have these four to six seat bicycles at Huntington Beach pier for rent. I have my own bike and Alan and I ride our bikes on weekends along the beach and we have seen others on these special bikes. So I thought this would be a perfect time for us to try this out. I found out quickly these bikes are a bit hard to ride, since my legs are very long, and I did get a good workout! We would all talk while were riding along the beach. We had a bell on the handle bars and a break to stop. We would ring the bell if someone was in our way. My mom and dad decided they wanted to join us, so they brought their bicycles and meet up with us. 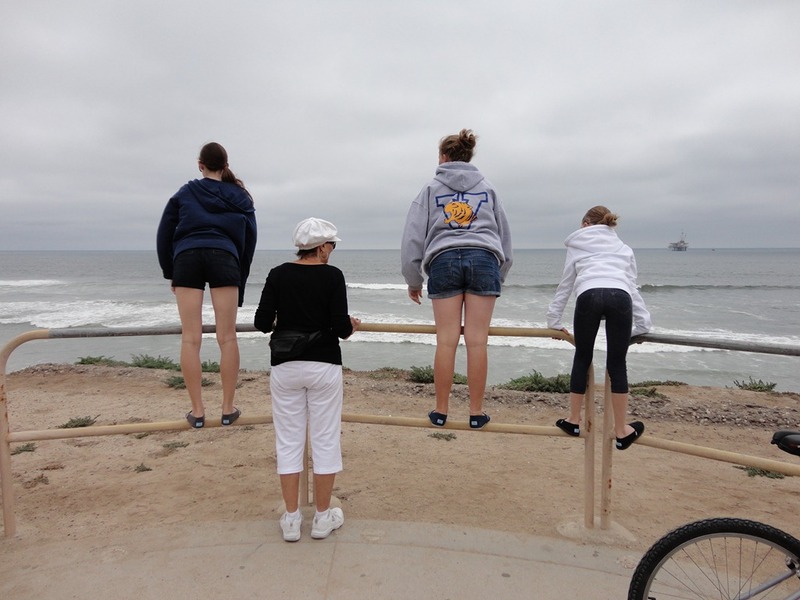 We rode along along the beach and up to this hill top point in Huntington Beach. Down below is a beach for dogs. It’s fun watching the dogs run and play with one another. When we rode back and down the hill the girls all laughed and screamed. We had so much fun that day! This entry was posted in children, families and tagged children, families on June 28, 2011 by Debbie Nichols. Last Thursday I got a phone call from my friend Pat Alivso from Military Families Speak Out. She informed me that she had forwarded my name and information to staff member of the Patt Morrison radio program. Patt Morrison’s Memorial day program was addressing challenges military families face, and my friend Pat knew we had a story to tell. The only problem was, I would be traveling home from Lake Havasu on Monday and crossing the desert, and cell phone service is limited. I was concerned of the broadcast time and the phone reception would not be clear enough for radio broadcasting. I told Pat thank you, but I just couldn’t see how I could be able to call in. On Saturday I got a call from the Patt Morrison’s program Producer. She shared with me the other guests on the show and the time 1:20 pm for me to call in. She understood that I would be traveling and they really wanted to share our story with Patt’s listeners. The time was later than than when my friend told me. At 1:20pm we would be in Indio where the reception would be good. The Producer asked many many questions about our experiences. She then shared with me her vision of a future forum with a live audience where the audience could ask questions, more interactive and was wondering if I would be interested on being on the forum. Would I, you bet. I love helping those that are now facing what I faced. On Memorial Day as we were driving home I thought about what questions Patt would ask me and I began to think back about that time of deployment. We arrived in Indio at 1:00 pm. We pulled off the highway and went to a shopping center. I told my husband to park our truck away from any other cars. I was concerned that when I would be speaking the audience would hear additional noise and possible feedback. The weather was mild mid 80”s unusual for this time of the year, but perfect for stopping and stretching our legs. At 1:10 my cellphone rings, it the Patt’s Morrison staff, asking me if I would like to be on hold and hear the conversation Patt was interviewing Tim Kahlor’s father was discussing with Patt his son’s injuries. This father has made our government aware of his son’ injures during the war, improper body protect guard and the challenges of medical assistance. It was very interesting. And I realized how fortunate our family is. Then at little past 1:20 Patt introduces me, sharing the challenges we faced being a grandparent raising our grandchildren, trying to keep the children connected to their mother and the difficulties I faced when the children returned back to their home. Patt’s experience as a reporter for LA Times, Winner of 6 Emmy’s, Golden Mick and received a Pulitzer, she made me feel welcomed and as if I was speaking to a friend. It was a wonderful experience. Before I knew my time was up. It was such a pleasure being on her show. I am really looking forward to the future forum. This entry was posted in coping, deployment, families, returning soliders, Stress and tagged deployment, families, media, Military, press on June 3, 2011 by Debbie Nichols.